In Fluid Green, the Danish textile designer Inge Lindqvist explores her interest in traditional stitched-resist dyeing techniques through the industrial felt medium. Primarily used in Africa, Indonesia, Japan, South America, and Central Asia, the basic technique involves stitching areas before immersion dyeing to prevent penetration of the color into the stitched areas. In Lindqvist’s interpretation, she uses a highly absorbent industrial felt that is folded, pleated, and stitched vertically before being immersed in a dye. Only about half the felt is immersed at one time, after which the piece is turned upside down to dye the other half. The “water-line” is depicted by the whiter areas on the felt. Lindqvist is one of the most important designers working with felt in Denmark. Educated at both the Gerrit Rietveld Academy in Amsterdam and Danmarks Designskole in Copenhagen, Lindqvist has primarily exhibited her work in Copenhagen. 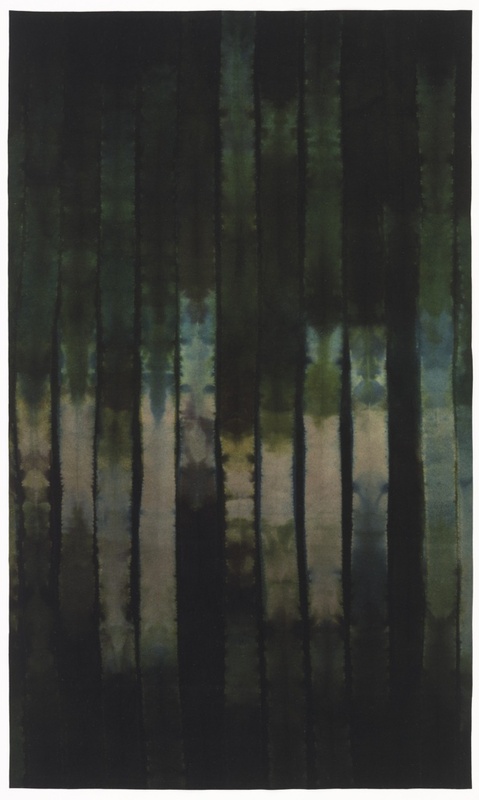 Fluid Green is one of two works that she made for the exhibition, “Light and Absence,” at the Danish Museum of Art & Design (Kunstindustrimuseet) in Copenhagen in 1998. She has been working with this medium exclusively since the late 1980s. This particular piece is important because of the application of this dyeing technique to felt, an unusual choice given its thickness and relative lack of suppleness. The effect, however, is incredibly rich and gives both a solidity and fluidity that would have been impossible with another material. Matilda McQuaid is Deputy Director of Curatorial and Head of Textiles.